I often hear from barrel racers all over the world admitting they struggle with self-doubt. But I know, there are many more who struggle with confidence issues that I never hear from. Of all the positive feedback I’ve received from Secrets to Barrel Racing Success, a fair amount of it has been on the Inner Game chapter. So when I decided to offer a limited time, special gift with purchase of “The Secrets,” I wanted to go even deeper. Now this one-of-a-kind book is available for purchase in print AND for Kindle. And if not, how do you GET confident? You certainly don’t just buy it at the tack store, or wake up one day a confident barrel racer, and never have another limiting thought (that’s not how it worked for me, anyway). Confidence seems hard to find, and it’s something that isn’t very openly discussed, and it’s certainly not something that people (barrel racers, especially) tend to jump up and admit they have a problem with! After all, barrel racers are supposed to be tough, strong, fierce and fearless, right? The truth is, even the highest-achieving barrel racer’s minds become plagued with self-doubt at times. Honestly, it doesn’t matter how much you’ve already achieved – no one is immune to the negative self-talk that causes our confidence to take a plunge. You may be at a point in your barrel racing where you realize that it’s a lack of confidence holding you back more than anything else; and that there really is a direct connection between the quality of your thinking, and the quality of your life. I hope you’re not willing to be held back any longer. I hope that the time to put your foot down and learn how to give confidence-busting negative thoughts an eviction notice is RIGHT NOW! “I am constantly trying to learn all I can and improve. This led me to your book. I wanted to let you know what a profound effect “The Confident Barrel Racer” had on me. I was brought to tears when I got to the part where you talked about riding with your mentors. I struggle with confidence every day and just having this resource available means a lot.” – Audrey R.
“I have really high standards for myself; therefore, those expectations are carried over towards my horses. But I am learning to appreciate what my horse is doing good and not being so critical. I appreciate that you are willing to put the time and effort into helping barrel racers become better athletes as well as a better individuals. Thanks again.” – Chezie D.
“I absolutely LOVED your book. I am so thankful for your insights… I feel like I am on the same journey, and by reading your book I have been fast-forwarded. I know I need to grow personally to overcome my confidence struggles. My heart aches to be back on top again, and I won’t stop trying. Thank you for your inspiration!” – Stephanie W.
I’m not going to deliver cold, hard techniques like a sports psychologist, or fill you with a bunch of fluffy psycho-babble, or even give you a firm kick in the rear in fine barrel racer fashion – I’m going to do all three of these things (and more), but in a unique, integrative way that serves barrel racers best. The Confident Barrel Racer covers eight key areas and concludes with two special bonus sections. Challenges of Competition – Develop awareness to avoid falling victim to the dangers that exist in the competition environment. Fierce Love – Get off the emotional roller coaster to develop a steady, unwavering level of confidence regardless of your circumstances or results. Self & Source – An introduction to two key relationships, that when developed and nurtured, will turn your life around! Four Steps to Confidence – A step-by-step guide to creating confidence, by helping you master change in the moment, then offering support all the way through integration. Be Here Now – Learn how to BE in the moment – the perfect mental space to be in a run where self-doubt cannot exist. Practices – Being a winner in the arena means developing winning habits in ALL aspects of life. Develop practices in three specific areas to optimize your confidence. Tips for Competition – Clear, concise action steps for overcoming nerves, achieving the perfect mindset, and creating laser-like focus to perform your best. Confidence Smashers – Have past experiences, past horses, or even people damaged your confidence? Get tips for overcoming past AND present challenges. The Confident Horse – There’s more to developing it than being a confident rider. Learn how to build your barrel horse’s confidence. Additional Resources – Recommended books, programs and more for further personal development and confidence building. “…very motivating and unlike anything I have ever come across! …such a breath of fresh air! I am definitely not the same person, I have much more wisdom and appreciation now. I am more willing and patient to take the steps to reach my goals, unlike my younger years when I wanted everything at once, and winning was definitely attached to self-worth.” – Shilah H.
“Heather, I just want to thank you from the bottom of my heart for putting this material together. My story is somewhat similar to yours. It inspires me (and others I am sure) to keep going I am so grateful you were willing to put yourself out there and compile this information. Thank you again.” – Anna E.
“I’m sure you hear this all the time but you have no idea how much your book has helped me and my horse already! I was just getting started in my barrel racing career right before God gave me my beautiful baby boy. I found myself doubting my ability but your book has helped me and my horse get back on track. 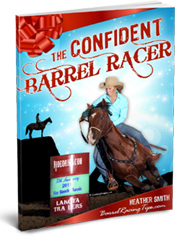 Thank you so much!” – Linda H.
I was so excited to first offer The Confident Barrel Racer as a downloadable PDF when I originally created it as a special bonus. Until recently was only available to those who purchased Secrets to Barrel Racing Success during it’s initial Holiday launch. So if you missed the opportunity to get it in the past, or would like to have this amazing resource even more conveniently at your finger tips, I’m thrilled to offer you the opportunity to get this special, one-of-a-kind book in print OR for your Kindle e-reader. If you you could use a confidence boost ASAP, then click one of the two options below to BECOME The Confident Barrel Racer. Feel free to get in touch and let me know how this special resource impacts YOUR life and barrel racing! Most of all, thank you for trusting me to guide you on the path to gaining authentic, lasting CONFIDENCE from the inside out.